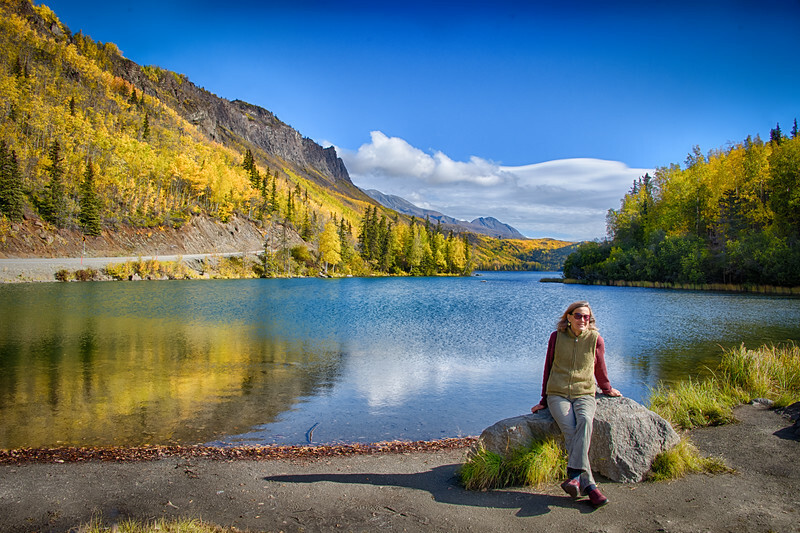 A few weeks up the road to visit the Maclaren River along the Denali Highway, and the Denali Road into the park. Snippets of the Alaskan and Glenn Highways as well. 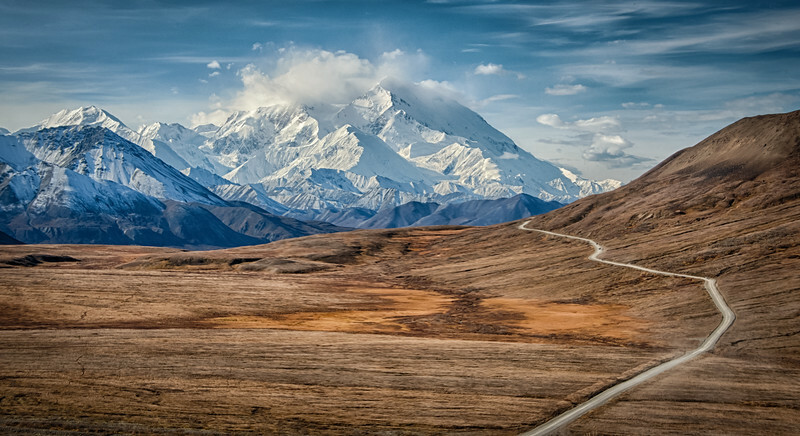 We are on the road to explore the Denali Highway and the Denali Road into the park. 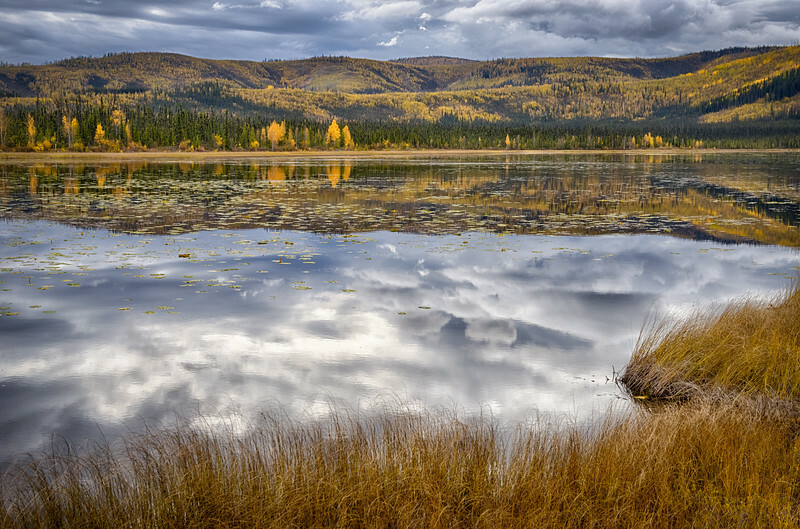 On the first day out the rain finally cleared and revealed unparalleled foliage fantasies in the Tetlin Wildlife Refuge. Given the nine-hour drive we had today to get from Haines to Tok, thank goodness it was raining. 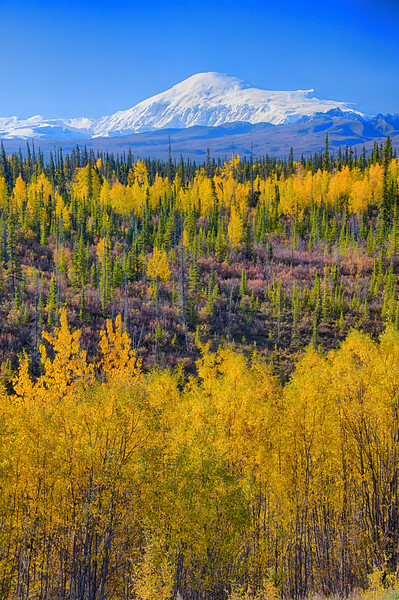 The Alaskan Highway is in full force for foliage. The weather broke in the Tetlin and gave me a break to mosey past the prolific blueberries and make a snap. 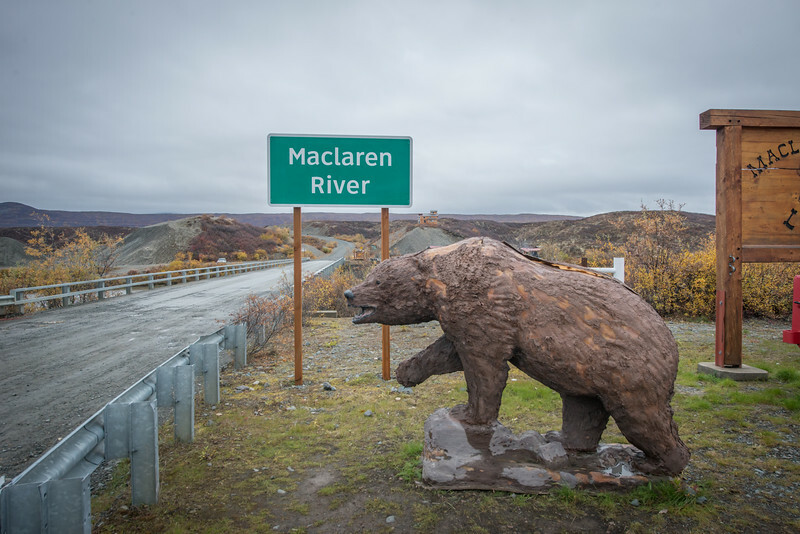 We are off to camp at the MacClaren Glacier for a few days. If it had not been for the rain, I doubt I would have made it to Tok in a day. The colors were beyond belief. Where I stopped to capture this view, blueberries were in abundance as well. Colors beyond compare, and reflections to boot, not to mention blueberries! Carpets of gold, courtesy of aspen. Day 2, a day of brilliant promise. I do not have a bucket list. I have a list, and I like to get things done before I have to fret about anything. 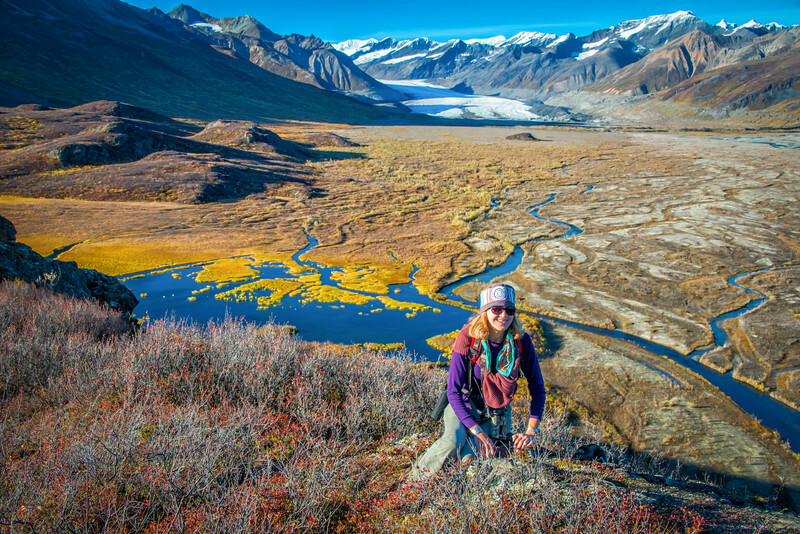 It has been on my list to enlist the Maclaren River Lodge to transport us to their glacier base camp so we could access the Maclaren Glacier and canoe back down the river. Here is the start to that tale, wherein Matthew took us ten miles upriver and dropped us off with canoe to find our way back home. 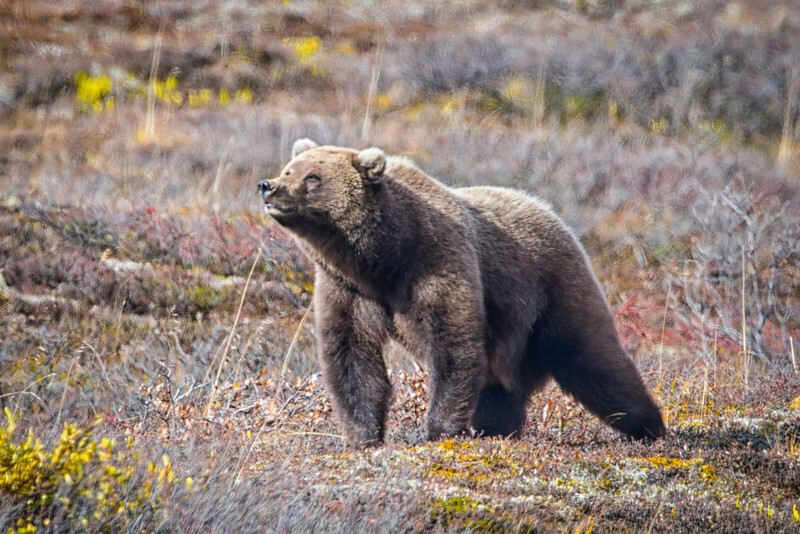 Matthew Christie Somerville ran us ten miles up the river from the Maclaren River Lodge on the Denali Highway and dropped us and our canoe (for the return trip) off about a half mile from camp. This time of year the river is running low and the boat could not reach camp. We dragged the gear across gravel bars on a sled, feeling very much like the "stampeders" who made their way into the gold fields of the Klondike gold rush. Our camp in in the distance, the glacier is behind "Big Rock" in the center of the frame. 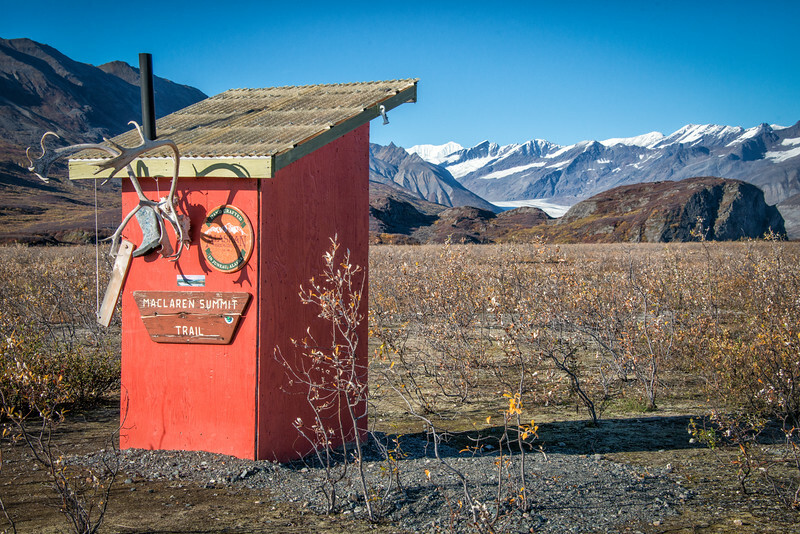 An outhouse with a view so fine she deserved a name. She is called Allison. Our first day in, dropped off about 3:00, we set out to climb "Big Rock" about a mile off for views of valley and glacier. Looking down valley from atop Big Rock, one can see our tent camp about a mile distant nestled to the side of the Maclaren River, which runs horizontal in the photo. It is late in the season,and we are the sole occupants in camp. 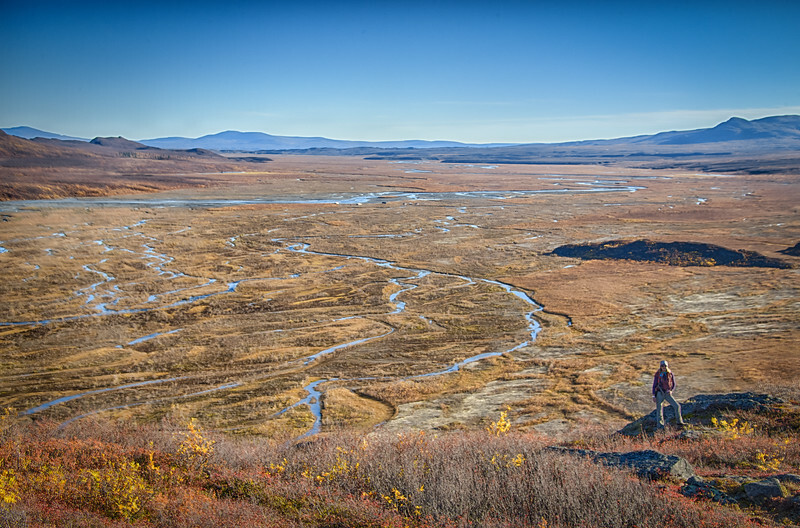 Matthew Christie Somerville ran us ten miles up the river from the Maclaren River Lodge on the Denali Highway and dropped us and our canoe (for the return trip) off about a half mile from camp. This time of year the river is running low and the boat could not reach camp. We dragged the gear across gravel bars on a sled, feeling very much like the "stampeders" who made their way into the gold fields of the Klondike gold rush. 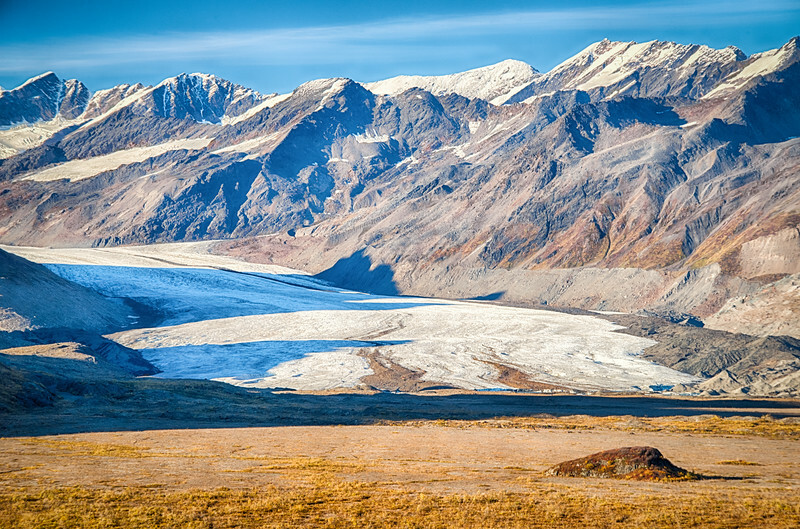 Atop Big Rock overlooking Maclaren Glacier, where we hope to travel to by foot the following day. It is about four miles off, and the weather looks great. Tundra swans are posing placidly in the pond below. Added treats, atop Big Rock we found several glacial kettle lakes, and blueberries were abundant. Picked plenty to put into tomorrow morning's oatmeal. Our home on the banks of the Maclaren River, with the moon rising. Perfect weather, which didn't last long. 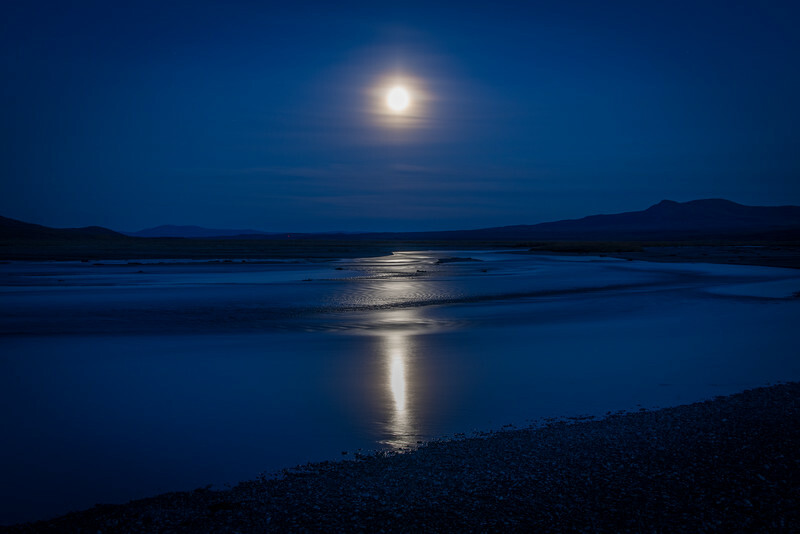 A perfect end to a perfect day, enjoying the moonlight reflection on the Maclaren River. The haze around the moon looked like a fur collar framing an Inuit face. 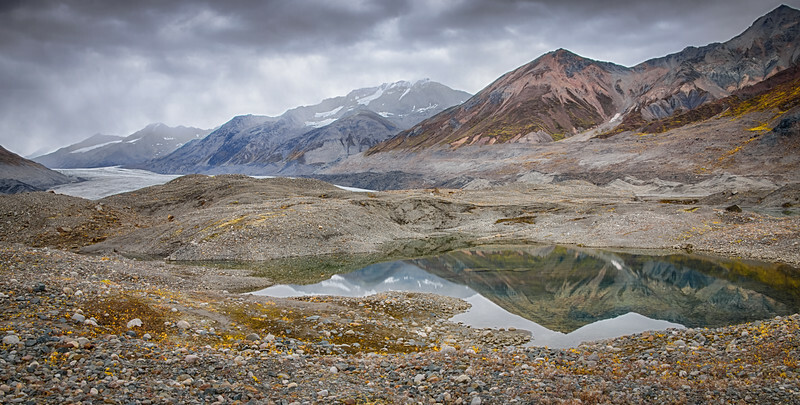 We departed base camp under 18% gray cool skies for the five mile trek to the base of Maclaren Glacier. 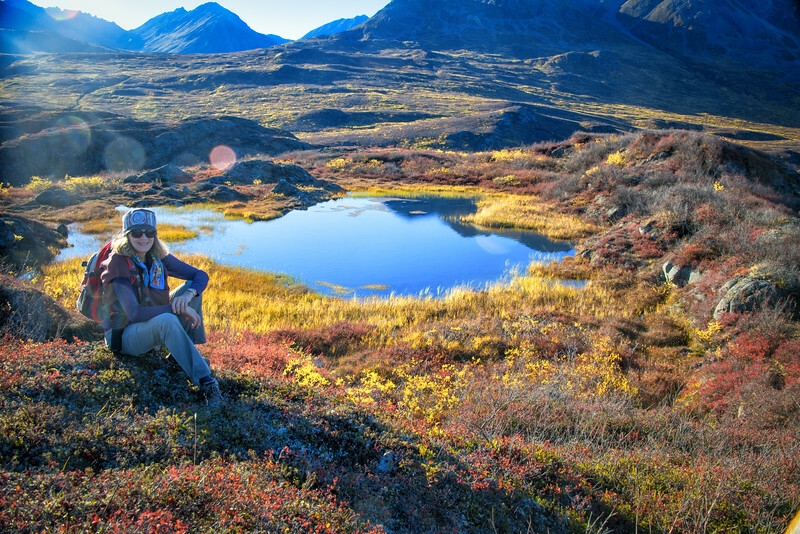 We wove our way across vegetated gravel bars and braided outwash channels (many of which were thankfully dry due to the late season) scaring up a covey of ptarmigan along the way. 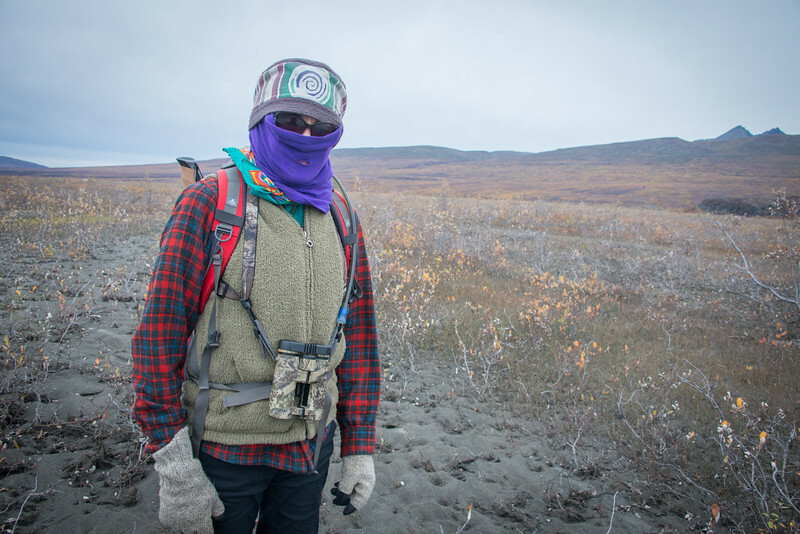 On our hike up to the glacier, I turned and found I was being stalked by a terrorist. Thought it might be ISIS. Turned out to be MISSUS. 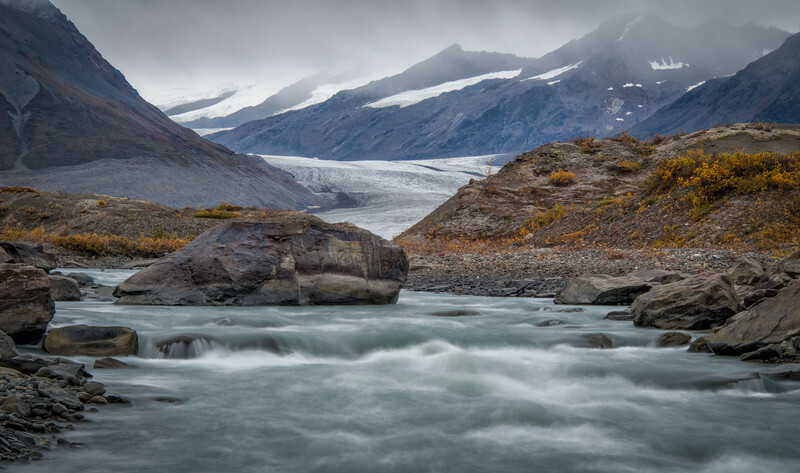 Here we have arrived at the main stream channel cutting through the glacial moraine, and the adventures took a new and interesting turn. 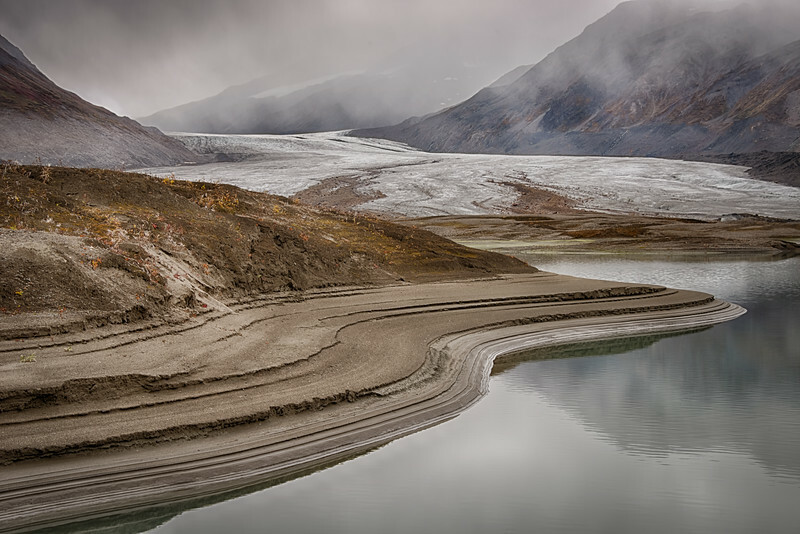 Through the gap and into the maze of moraines in the glacial till of Maclaren Glacier, we entered an other worldly environ where we threaded the needle through a labyrinth of lakes and channels as the sky dropped and shrouded the vaults that fed the river of ice still just beyond our reach. A myriad of media in the moraines of Maclaren. 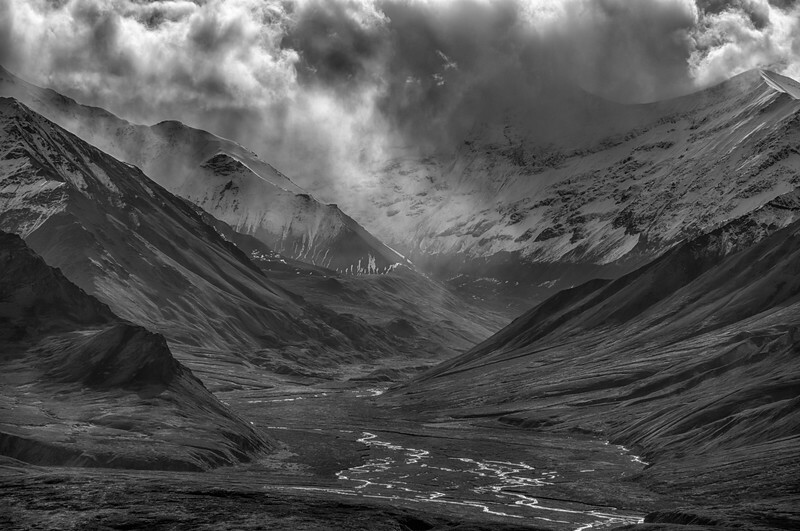 Piles of gravels, plots of blackened moss-rich cracked soil that resembled spongy lava, and many terraced pond shores. We continue to wind our way through the maze to the face of the glacier. 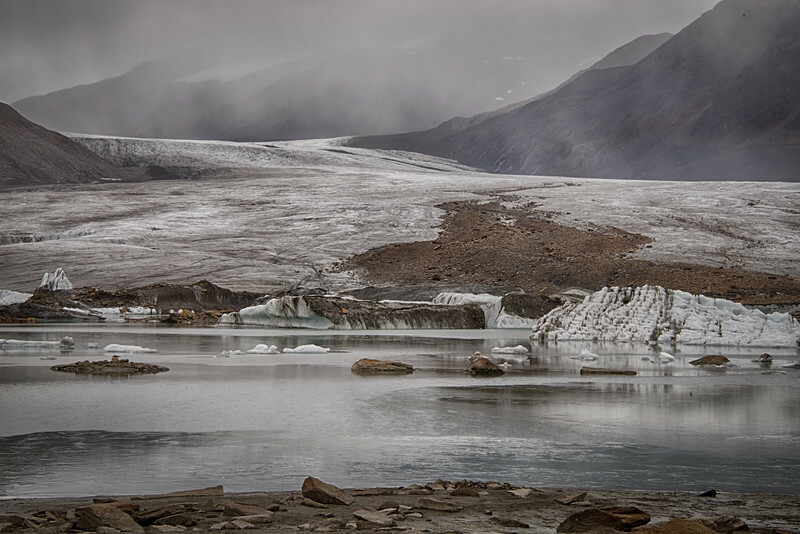 We have reached the melt pond at the foot of the glacier, and clouds continue to drop. And here, at the end of our journey in, it started to rain, and continued to rain and blow as we walked the 5+ miles back to camp. We were well provisioned with rain gear, though our gor-tex boots gave out and soaked through about half way along the trip. The rain kept up all night, and the next day, though it stopped raining, the skies continued to threaten, the river was up about two feet and rolling along. We radioed in to cancel the canoe portion of the trip and requested a pick-up. It was a good call according to the Lodge, and we now have something left on our list. Next time! Back at the Lodge, and happy to have a heated car to continue our journey. The banks of the Copper River, outside of Glenallen, where we spent the night. Wrangell St. Elias is off in the distance and under clouds. 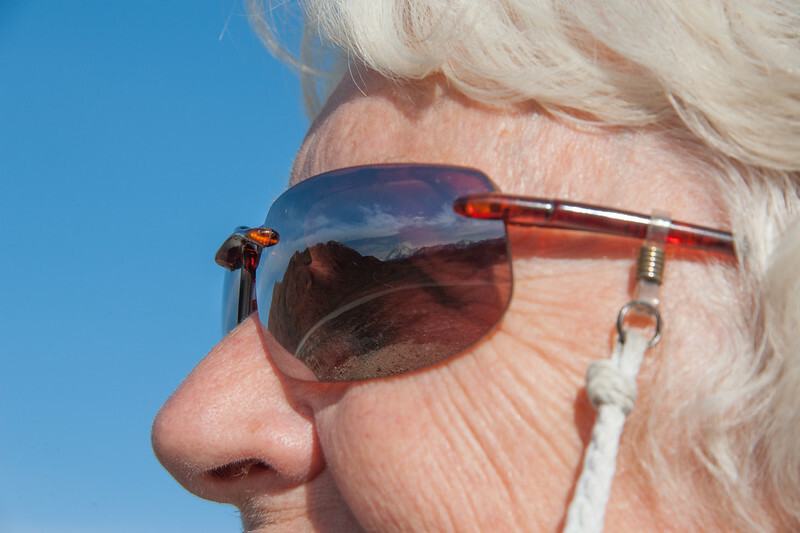 We drop into the Visitor Center and decide to make the MacCarthey Road our next trip in May. A real beauty. Long Lake is lovely too, and many people feel compelled to stop here and grab a photo of the lake, for some reason. 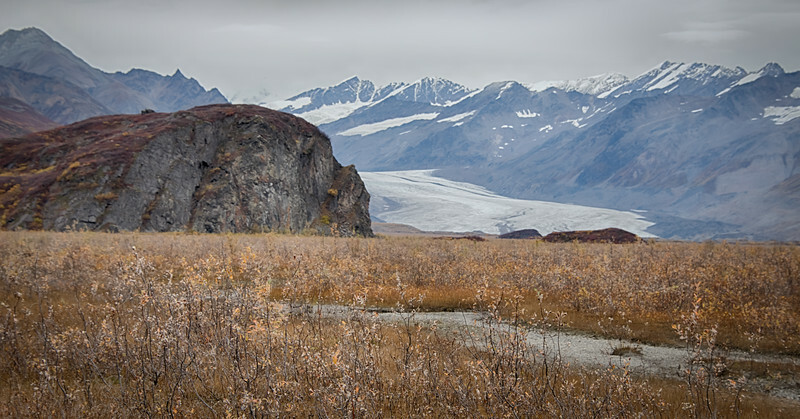 From the Maclaren Glacier adventure, we headed over to Denali. 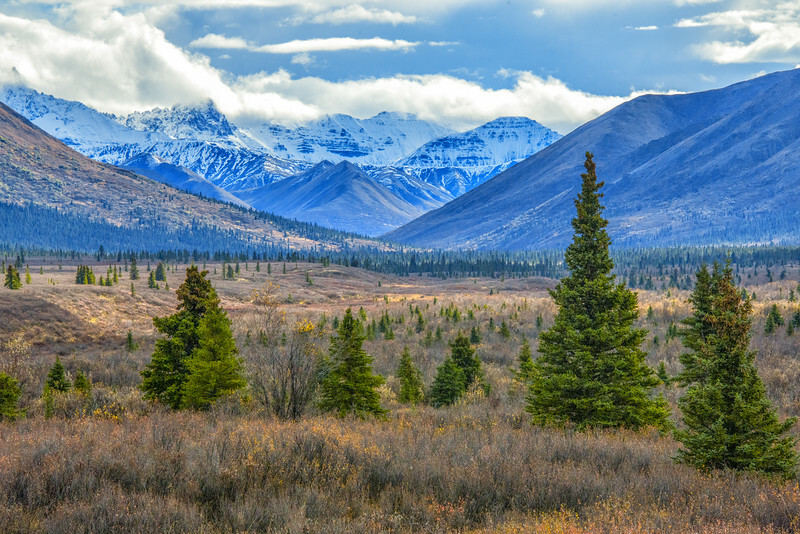 We have arrived in Healy, and look forward to a drive up into the park with old friends and new friends. 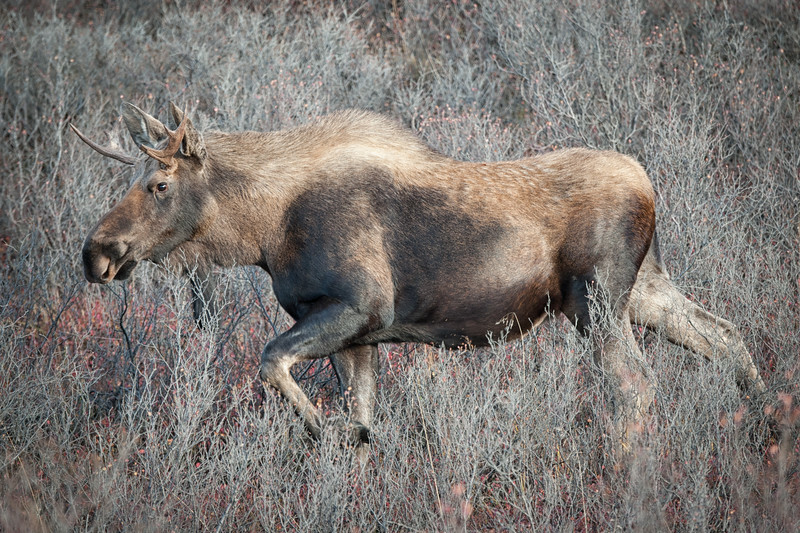 First night we make the evening run into the first few miles of the park road in search of moose, who are in the rut. 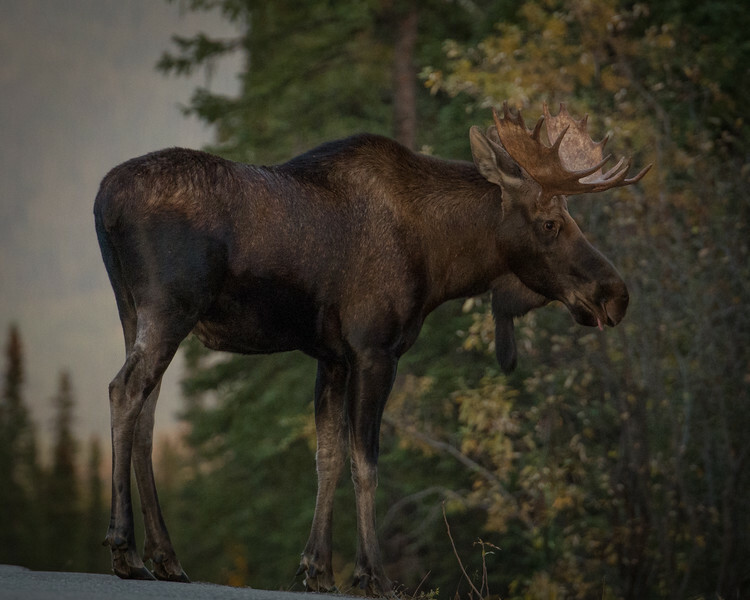 Moose mug shot. 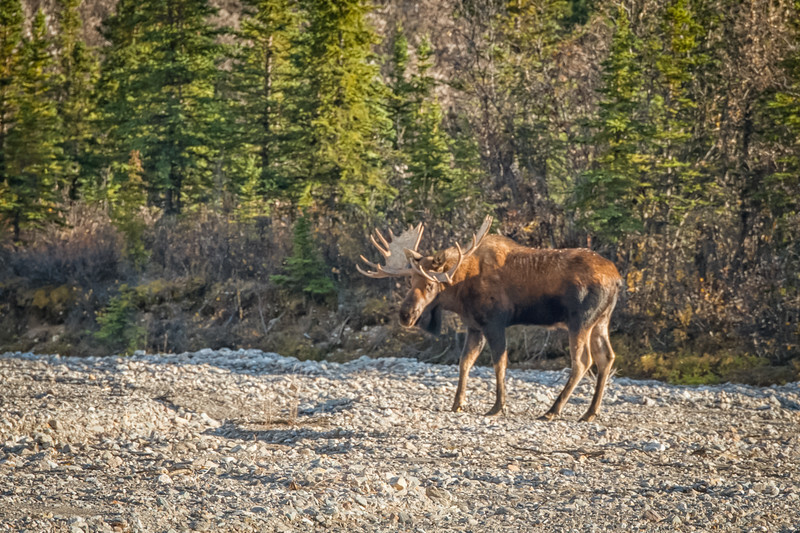 Great bull along the road in Denali. This was the one clean shot I got of him as he walked through the bushes or people walked in front of my camera. Typical moose jam. 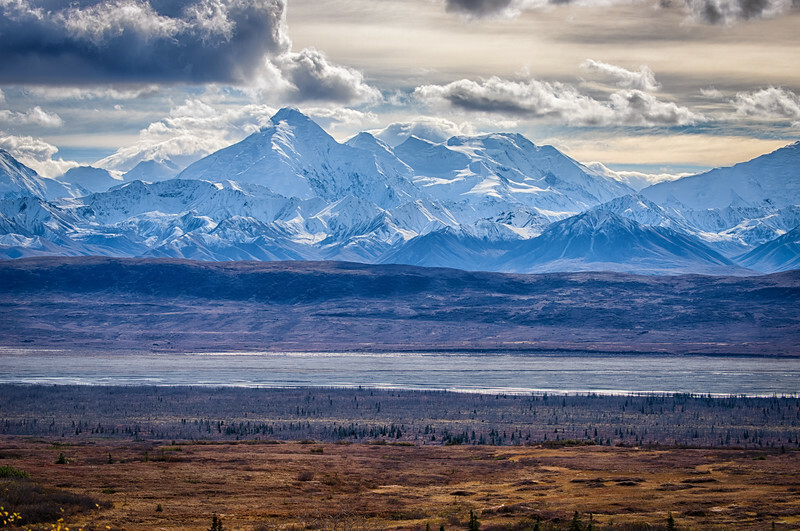 We enjoyed our lottery day trip into Denali with Linda Orlow and friends, and what y'all know? The mountain came out for us again and just got better and better through the day. This photo was the first appearance. 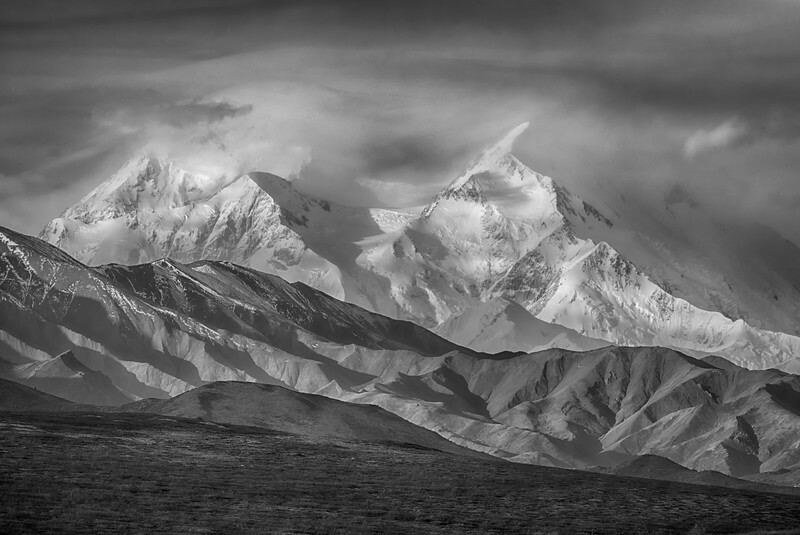 Heaven parts the clouds, Mortals gaze in wonderment, Denali magic. I want to take this Pointer hunting with me someday. 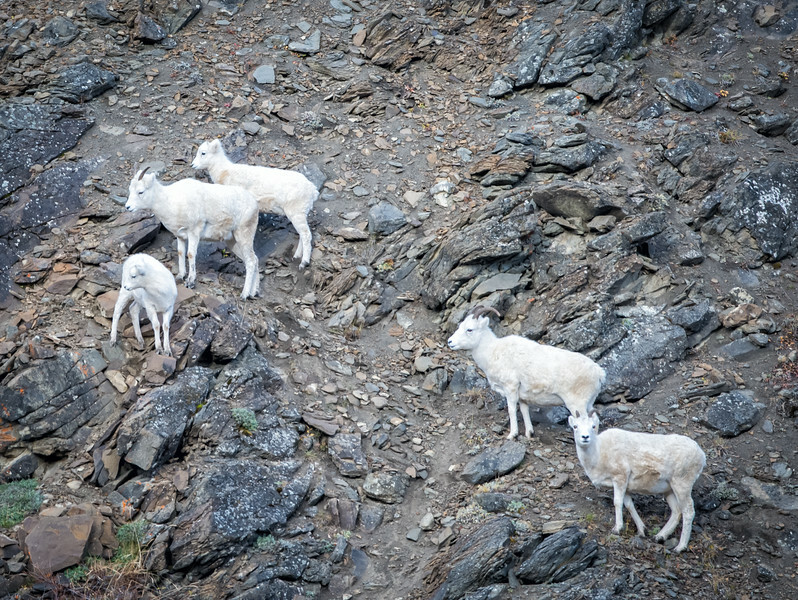 The preservation of Dall Sheep was the motivation behind the establishment of Denali as a park. 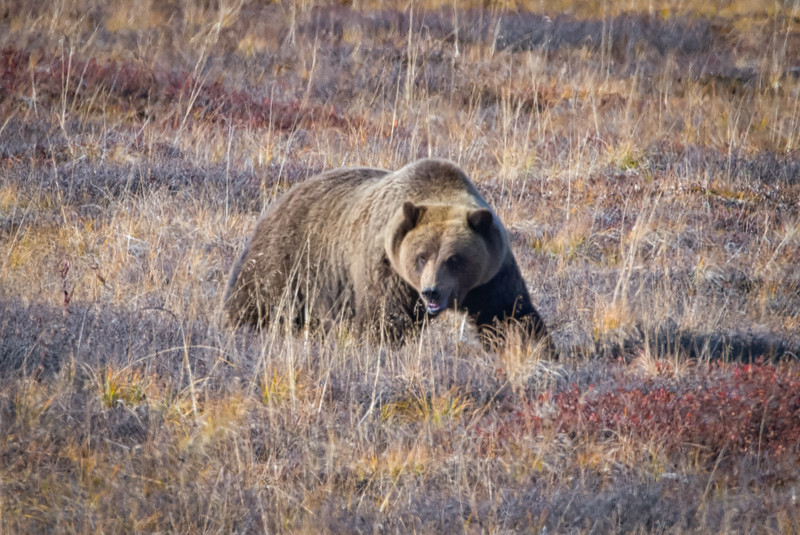 According to the literature, coastal brown bears are supposedly bigger than grizzlie due to better food sources, but I have never seen that to be necessarily true. This fellow, and others we saw were pretty well stocked and stacked on blueberries. Polychrome Pass, on the way toward Eielson Visitor Center inside the park. Normally this is a bus stop. Today, no busses, only cars of happy lottery winners. We are fortunate the massif has appeared for us. Many people visit the park without ever seeing the tallest mountain in North America. 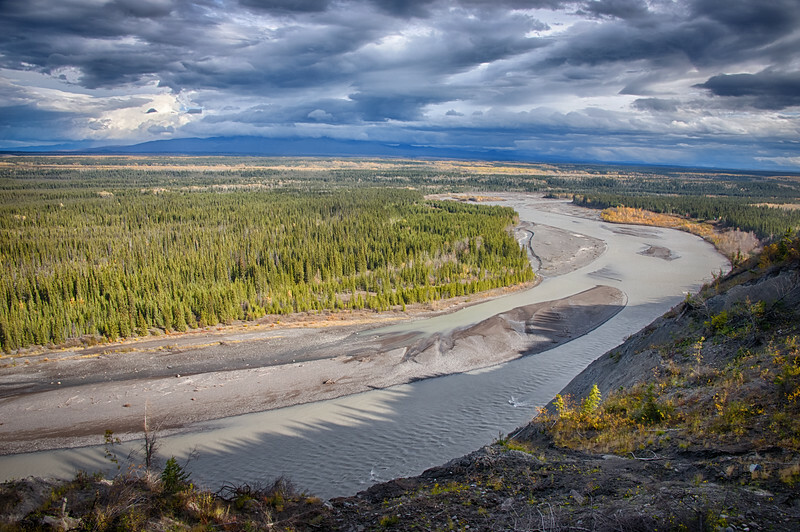 A rather large braided river bed, typical of this glacial country. 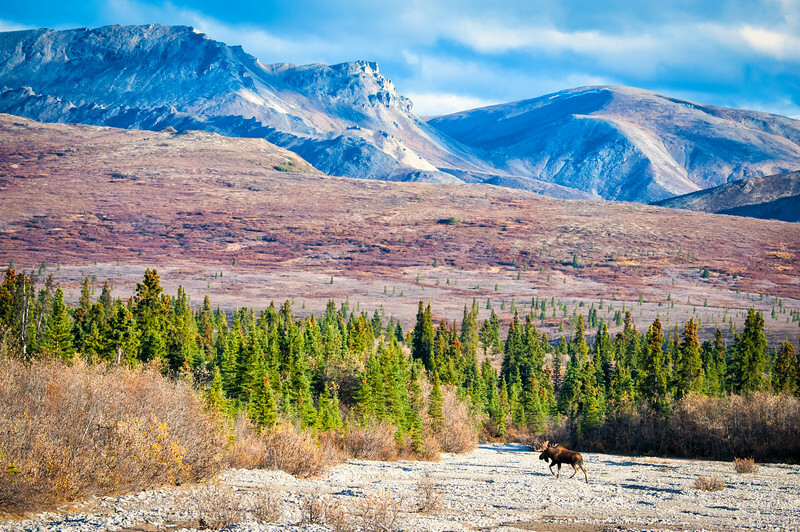 Magnificent views abound at every turn. A grand bull has gotten everyone's attention. 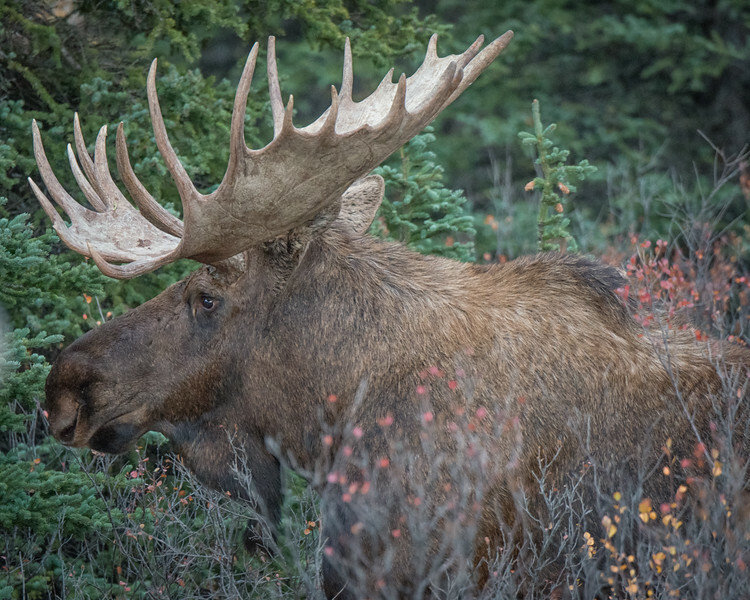 It is not hard to spot moose. Just look for the dozens of cars pulled off to the side of the road, or maybe just stopped in the road like there is no one else but them. Waldo Moose, homeward bound. 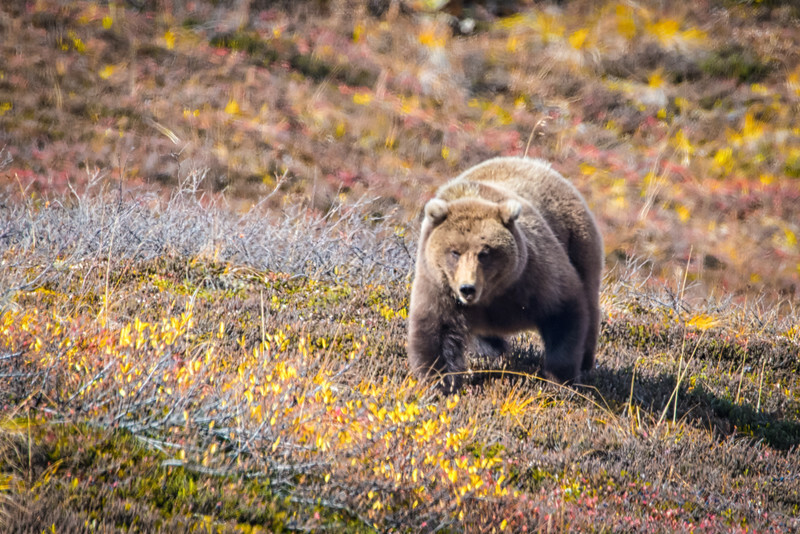 I think I like these habitat shots better than the close ups. There is a story here. 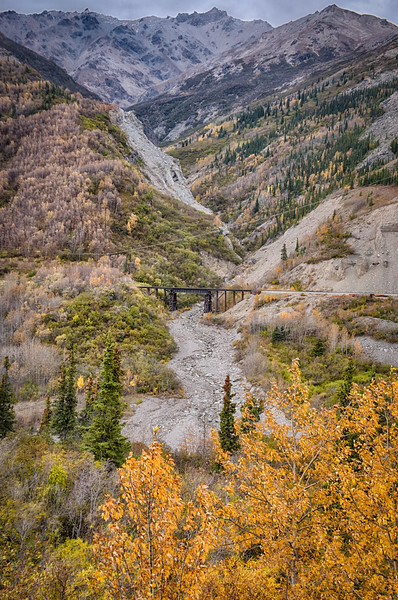 Trestle over Sheep Creek, south of Healy, north of the Park entrance. 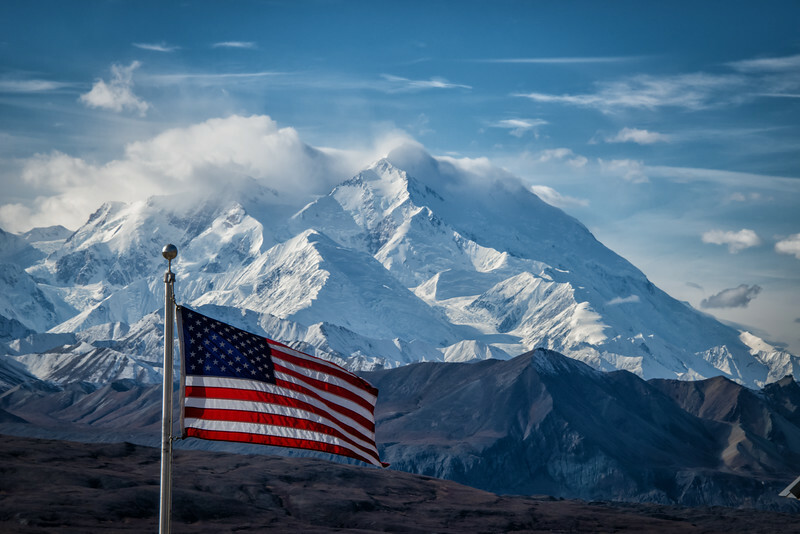 Our last full day in Denali, visiting the site of the original tourist facility at Savage Camp, where tents were provided. Quite a change from the present day cluster circus on the Park Highway. Happy they keep the hordes somewhat at bay.